Snack Girl has a secret. With over 27 inches of snow outside her window, she can't look a vegetable in the eye. What do you do with kids that have been out of school for 2 days per week? You make cookies! And, what are the best cookies? Chocolate chip cookies! I contend that the only chocolate chip cookie that you should ever eat is one that you make yourself. And it shouldn't be stale. Eat it as SOON after baking as humanly possible. Some of you are probably frustrated right now. "Hey, Snack Girl, this is NOT a healthy snack!!" No, it isn't. But, I believe treats should be TREATS. We can't decide a food is BAD and never eat it if we love it. We need to find ways to incorporate the food we love into our diets. I contend that if you bake all your own bake goods, you will never eat a stale cookie from the supermarket again. Also, the recipe below is 1/2 the size of a normal chocolate chip cookie recipe. Mine makes 24 cookies - not 48. Compared to Chips Ahoy, you are getting real butter and eggs in the recipe versus mono and diglycerides (yuck). There is also the fun of making it yourself and the smell of cookies in your house. Do you know that real estate agents will bake refrigerated cookie dough in a house when they show it? What kind of stuff would you get if you baked cookies? This recipe is my favorite because I just have to remember the number one. 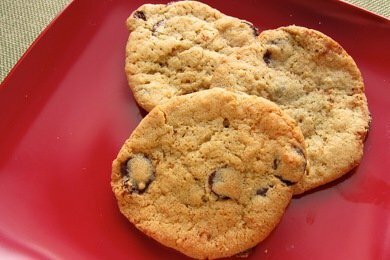 One stick butter, one egg, one cup flour, one cup chocolate chips - if I have that in my pantry, I know we can make them. Preheat oven to 375 F. If you have an electric mixer, cream butter, sugar and egg. If you don't, just soften butter in the microwave for 10 to 20 seconds (make sure it doesn't melt) and beat with a fork. Add the dry ingredients, stir in by hand and then stir in the chips. Drop spoonfuls of batter onto an ungreased cookie sheet, and bake for about 10 minutes. Cool on a rack for 10 minutes before eating. Please share any great cookie ideas or recipes. I big pink fuzzy heart you Snack Girl! I haven't tried it yet but you can subsitute the butter with olive oil and the sugar with agave nector but use 1/3 less than the recipe calls for. I did this with banana bread and threw in some oatmeal and it was wonderful. Thanks, Snack Girl, for a simple chocolate chip cookie recipe! I also agree that cookies are a treat that should only be enjoyed warm out of the oven (with a tall glass of milk, of course)!!! Ahhhhhhhhhh (sigh of satisfaction). There's nothing quite like a homemade chocolate chip cookie! One stick of butter is equal to 1/2 cup, right? Though we run a weight loss camp we believe treats are ok! We bake in our house once a week so that we can have fresh baked treats that have pure and simple ingredients. This recipe sounds perfect for a snow day. Sodium 140mg total carbohydrate 17g sugars 12 protein 2g There is nothing like homemade, but these are great! I've been wanting to try to bake chocolate chip cookies with WW flour but I'm nervous they will end up hard as rocks! I am with you on just eating cookies sometimes. Dangerous that they "facilitate large purchases". Stay away from shopping on line while eating cookies! Just made these with the kiddies. So yummy and easy! I totally agree. When we lived in MD we always made homemade pizza and chocolate chip cookies on snow days. Now they're calling for snow in TX and I checked my pantry to make sure I had a bag of choc chips. I believe all things in moderation including moderation, especially when it comes to freshly baked chocolate chip cookies! You and I are so on the same wavelength, Snack Girl! There is no point wasting one's time/calorie allotment on crummy cookies. Enjoying the snow? @Andrea - I used White WHole Wheat flour and it worked great. I think you could go 1/2 wheat and 1/2 white and it would be good.